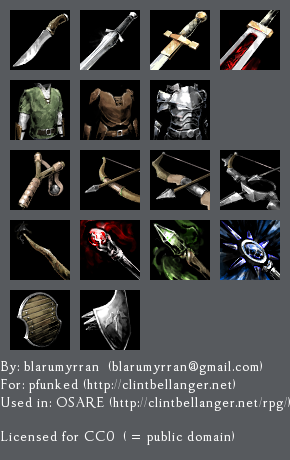 Weapon icons commissioned for OSARE. Drawn over 3d renders by pfunked. These are excellent! And they set a great, dark mood perfect for the genre. Instead of only using 32 pixel icons I'm pretty sure I'll be adding full-size icons to the tooltips in-game. They look that good. 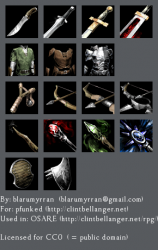 Good job Blarumyrran, looks like these icons have also been accepted for Wesnoth! Wow. These icons are really striking. Especially the staffs. Great job, man, great job. First off, I really like the works. Second,I need to verify this is safe to use. When you say commissioned for OSARE, I would assume they had no agreement that they own the rights, or any part of it, such as resale. Did you specifcially retain the rights to release this as CC0/Public Domain? I only ask because I have a strict legal team, and they want to make sure there were no restrictions placed. I trust that you do, but I'm looking for clear verifications to satisfy my legal team. This is a year-late answer, but I don't want anyone stumbling by to think there is something wrong here. There is in fact no issue whatsoever, but "hpdvs2" is ignorant of American law. Artists retain copyright ownership of their work in all cases but two under U.S. law . The first case is "work for hire", which is legally speaking nothing like what it sounds like. In order for something to qualify as a work for hire, a employee-employer relationship must exist (and be recognizable by a court). Independent contractors and commissions do *not* count. There are many factors that courts use to assess the difference between an employee and a contractor; they include whether a person sets their own rates and hours, what degree of independence they have in performance of duties, where they work, tax categorization, and so on. Flare, formerly Osare, is an free (libre and gratis) project lead by Clint Bellanger. There's no commercial company behind it. Thus it should have been immediately clear from public facts visible with a few minutes research that this was *not* a work for hire. Now for the second case in which copyright ownership is not vested in the artist. That happens only based on explicit written contractual agreement for the transfer (typically at time of creation, but sometimes later). Clearly there either was no such transfer or Bellanger fully approved of the license release considering he posted receptively to this almost immediately. Even if one couldn't discern any of these open facts, it should still have been brutally obvious that there's no license issue considering the asset had been available for five straight years with no issues (or even complaints). I would kindly ask that people think for themselves and actually research the subject before posting low quality comments on the internet that misinform and distract from more valuable matters. To anyone who bothered to read and understand this post, you have my thanks.